Teenya Gilliam had just lost her hair from chemo. She wasn’t yet comfortable going to the grocery store without a wig on, let alone being photographed. Yet, she found herself in September 2017 dolled up—and wigless—waiting to be photographed on a crowded street. The occasion: Pamper & Portraits, a day aimed at allowing survivors to focus on caring for themselves, rather than on their diagnosis. New Jersey photographer Jackie Stinsman planted the seeds of the Pamper & Portraits initiative after her cousin was diagnosed with cervical cancer in 2017. “The only thing I could think of to do, besides bake a casserole, was to provide her with family portraits before she starts this next chapter,” Stinsman says. Gilliam, a medical assistant for the urology department at CHOP, says seeing Saporito “hurdle through everything she’s gone through” and come out smiling has been a constant encouragement. 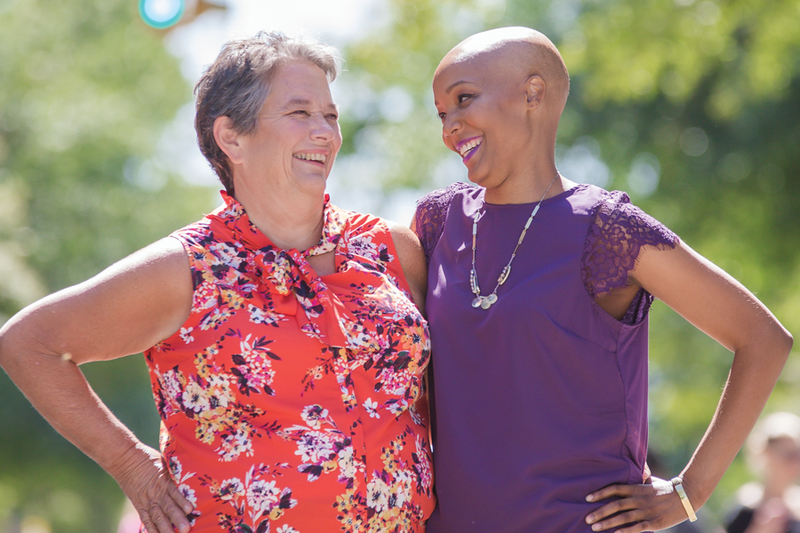 The experience also provided Gilliam a new outlook as she went through chemo, as well as the confidence to show off her bald head. “When I first looked in the mirror after being made up and styled, I cried,” Gilliam says. “I always had an image of what I looked like being bald, but I hadn’t seen photos, and I saw that I actually looked pretty.” Gilliam has a poster from that day on her wall, blown-up poster size, to remind her of what she’s gone through over the past year—as well as all that’s ahead of her. She was told last winter that she’s cancer-free. Padrone and Stinsman both say they plan to recreate Pamper & Portraits, but they also hope to see other women connect with Mamas Move Mountains to organize their own Pamper & Portraits events—or even come up with their own way to make an impact. “It’s about figuring out how to use your passions and abilities to help people, putting your gifts to good use,” Padrone says.